That which follows evidences Spencer C. Young’s extensive expertise in banking and commercial mortgages, thereby underscoring the credibility behind the damning allegations against Paragon Commercial Bank and their attorneys Poyner & Spruill, resulting in a 31-count indictment, reflecting the manifestation of twenty separate elements of fraud in what was . . . 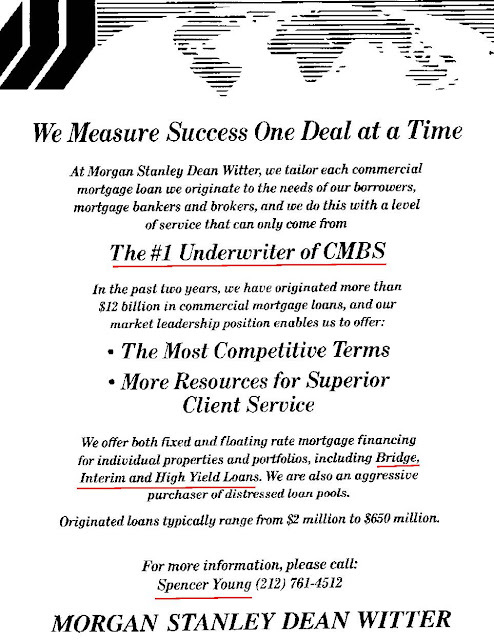 These include some Commercial Mortgage Backed Securities ("CMBS") trade articles, brochures associated with some of Mr. Young's professional speaking engagements, as well as professional evaluations received during his tenure as a commercial real estate investment banker at the “Houses of Morgan” – to wit, JPMorgan and Morgan Stanley, where he headed up their respective CBMS finance & securitization businesses (a/k/a CMBS conduits), and completed . . . The supporting documents included in this Exhibit are segregated into five sections, the context of which are summarized below, and can be accessed via hyper-links denoted in the "Section" column. Various articles in the leading trade publications report on such items as: (1) JPMorgan heading the field shortly after Spencer C. Young founded the CMBS business there; (2) Mr. Young’s formation of the most “diverse and high-powered group of [financial institutions]”; (3) Mr. Young participation and viewpoints on a panel of experts discussing the fusion of Real Estate with Capital Markets at a Columbia-sponsored roundtable discussion; and (4) a front page article on Mr. Young’s plans for a fully-integrated real estate finance, securitization and investment program. Various annual listings of the leading Wall St. Commercial Mortgage Lending & Securitization programs, along with their Chief Executives running those businesses, where Mr. Young is shown in that position for both JPMorgan and later Morgan Stanley. Conference details of various buy-side and sell-side topics in Commercial Mortgage Lending & Securitization in which Mr. Young was featured as an expert in the field. Includes: (1) Announcement of achieving #1 status as an underwriter of CMBS (Commercial Mortgage Backed Securities) while Mr. Young was running Morgan Stanley’s CMBS Conduit business; (2) details of the IQ® (“Institutional Quality”) brand of CMBS, which Mr. Young developed and trademarked, which was intrinsically worth in excess of $250 million; and (3) a humorous award presented to Mr. Young at one of the annual Mortgage Bankers Association conferences for developing a highly secretive “black box” underwriting and pricing model.